In the modern age, Large Goods Vehicles (LGV) are paramount in the transport and distribution of a wide range of goods. From dairy products to dry goods and more, the need for Large Goods Vehicles in the UK is ever-increasing. According to the UK Government’s latest domestic road freight report, 149 billion tonne kilometres of goods were moved across the UK between April 2017 and March 2018. Therefore, in regards to job prospects, there is a huge demand for qualified Large Goods Vehicle drivers. Read on to find out the requirements needed to become fully qualified, what you will be able to drive with an LGV driving licence, working hours and the opportunities arising from choosing this career path. In order to become a fully qualified LGV or Heavy Goods Vehicle (HGV) driver, the minimum age is not the same as being able to drive a car or moped. You must be at least 18 years of age to qualify, as well as already having a full car driving licence. Through having a full car driving licence, you will already possess the knowl- edge of UK road safety and have excellent driving skills to navigate your way through busy British roads and motorways. Whilst it is possible to obtain a licence independently on an LGV course with a private training provider, you can also apply for jobs as a trainee LGV driver with a freight or transport & distribution company. You must have a Certificate of Professional Competence (Driver CPC) in order to drive LGVs and HGVs. Other skills besides excellent driving skills are needed as a Large Goods Vehicles driver. For instance, this position is largely customer-based as you would be transporting all types of goods and products either to consumers, businesses or corporations. Therefore, you need to have a polite manner with the customers and people you deal with. On top of this, organisational skills are required, as you would need to complete record sheets and paperwork accurately and accordingly based on the type of goods you transport. It is also good to remember that being able to amend routes when travelling and being able to follow traffic reports is essential in this ever-evolving position. Once you are qualified and hold a valid driver’s licence for LGV and HGV vehicles, you must then be aware of exactly what size of vehicle you are legally allowed to drive. You will be legally able to drive vehicles over 7.5 tonnes, including articulated lorries, tankers, transporters and trailer wagons. Working from depots, distribution centres and warehouses, you will carry goods from across the UK markets all over the UK and indeed overseas if required. Besides driving lorries, your duties may also include planning delivery schedules and routes with transport managers, supervising or helping to load and unload goods, safely secure loads, follow traffic reports ad com- pleting delivery paperwork and log books. As an LGV driver, you’ll usually work between 37 to 42 hours a week. Overtime may be available but there are strict laws about the number of hours you can spend driving between rest breaks. Most of your time would be spent on the road, and you would drive day and night in all weather conditions. Overnight stays may also be necessary as part of your duties. In terms of career path and progression, you could take further training and gain an Advisory Dangerous Goods by Road (ADR) Certificate, which legally allows you to drive hazardous goods such as toxic chemicals by tanker. You could also progress further and become an LGV instructor, freight transport planner or move into a mana- gerial role. 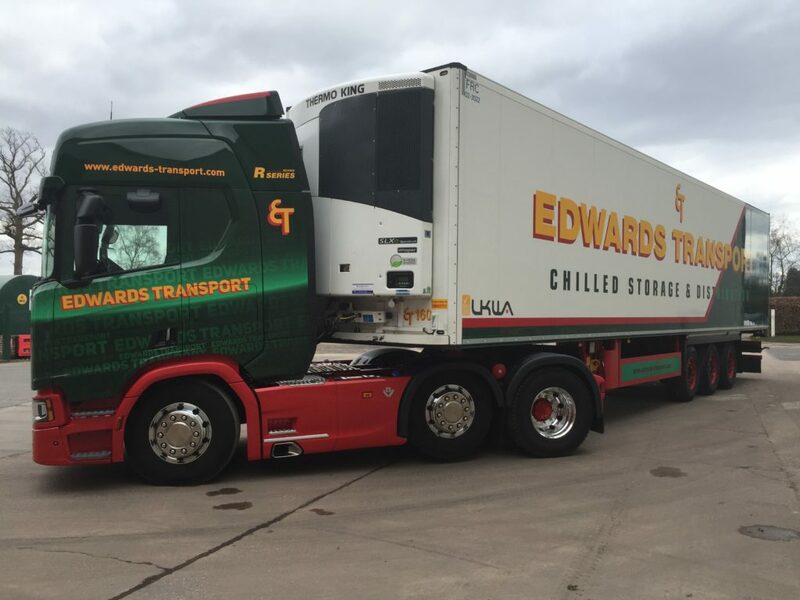 With over 30 years’ experience in transportation, here at Edwards Transport we provide an efficient and varied service to companies through both the UK and Europe. Based in Shropshire, we are conveniently situated to allow for a robust road network, thus meaning that your needs are met as efficiently as possible no matter your location. • Modern, all Scania fleet. • Excellent pay and conditions. • Varied work and shift patterns. • Day and night work. Class 1 experience is preferred, as is an up to date Driver CPC/qualification card. Wages are paid weekly. Training schemes for drivers with Class 2 experience may be offered where appropriate.